Pots are constructed either of wooden slats or, more commonly, coated wire mesh. They are set on the bottom individually or in strings and harvest various species of shellfish and finfish. In New Jersey's waters they are used to trap lobster, blue crabs, whelks (often called conch) and sea bass. Pot fishing can be done in shallow estuaries, in inshore ocean waters and in deeper water offshore. 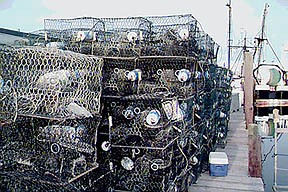 The traps range in size from the two or three foot long crab pots to the very large, deep water traps used in the Bering Sea tanner and king crab fisheries. These can be ten feet square. The smaller pots are hauled from the bottom by hand while the larger traps require hydrtaulic haulers. The pots are usually baited but often, particularly on flat, sandy bottoms, it is thought that the quarry enters traps as much for the shelter they offer as for food. Traps are a form of semi-permanent staked net designed to intercept and hold fish during their annual or daily migrations along the coast. While they used to be fairly common on the New Jersey coast just outside the breakers, there are no ocean fish traps in use here today.